Amelia Presley is a military veteran and country music recording artist. She has written nearly 100 songs and released a 10 song LP in 2013. She began recording her debut album in Nashville and named it “No Pony Ride”, in honor of her horse she sold to pay to record the LP. 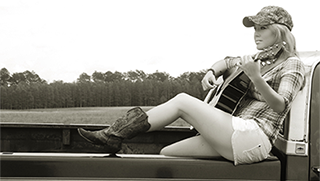 Amelia has toured with country music legend Ronnie McDowell and continues to play nationwide. Her newest single, “Hard Headed Mama”, was released in January 2016. Shortly after, she signed on with Heart Songs Corporation.